Living in the center of the city, you can get a bit fed up with the smog and the insane amount of people. For a physical and mental break from the city madness, we decided to take a day trip to the outskirts of Shanghai. Chinese people love to travel and take 1 or 2-day trips on weekends, so there are plenty of tourism agencies that offer cheap deals. We picked a random one that hit up Zhu Jia Jiao (朱家角), a small, ancient town built around riverbanks. With its main transportation being the small boats steered by old men with single oars, the town kind of resembles an oriental and less romantic version of Venice. Like any other water-reliant town, seafood is a huge part of its culture. Fishermen sell freshly-caught seafood right off their fishing boats next to the shore. They literally pull live fish right out of the water and sell them to tourists in plastic bags. It’s as fresh as it gets. 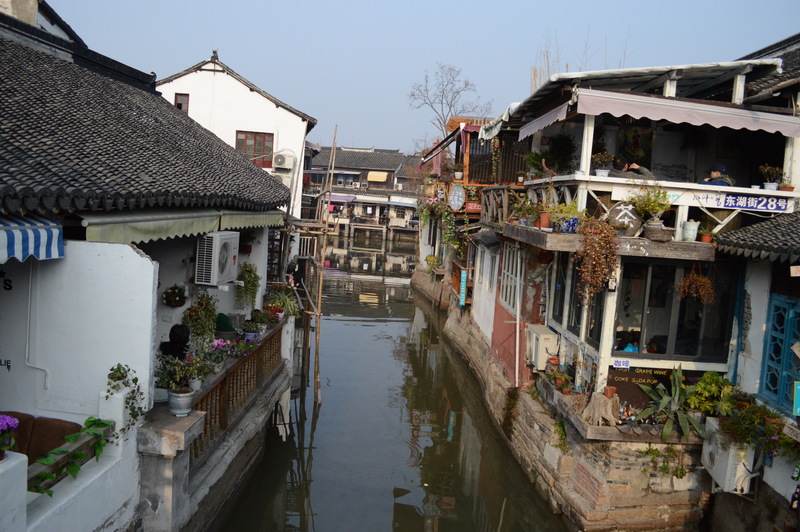 The streets of Zhu Jia Jiao are basically narrow sidewalks along a main riverbank, with staircases that lead you down to the man-powered boats and no fences. I was surprised no tourists fell into the mucky water. This town has thousands of years of history, and despite its new souvenir shops, restaurants, and cafes, the main structures are preserved from the old age. 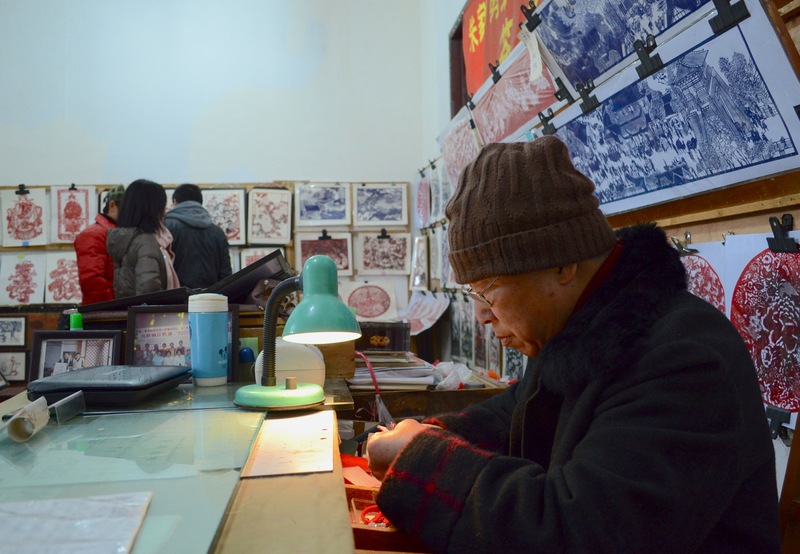 The old post office, Chinese medicine shop, and buddhist temples from the Qing Dynasty still reside in the town. Then when two tourists asked for a bigger customized piece, he became displeased by the fact that he was making them wait while he worked on a piece for us foreigners that only cost 10 kuai. We were impressed by his talent, but not by his narcissism. The food in the town was delicious, with locally brewed beer, amazing fried egg and fresh indigenous seafood. We sat on the 2nd floor, which overlooked the riverbank and allowed us to watch the boats casually stroll by as we enjoyed our food. The food is cooked in a homey kitchen by one little lady and waited to us by what I assumed is her husband. It definitely had a homeliness and personal touch that lacks in typical Shanghainese restaurants in the city. Although we hoped for an authentic look at a more rural area of China, I realized that the town completely survives on tourism. During the off-season for tourists, each visitor that walked by are harassed by shop owners who are desperately yearning for customers. When I took photos of an old couple who managed a fish fry stand, they responded to my intrusion with something along the lines of “please help us out, buy our food.” Although having an entire local-owned restaurant and its one waiter to ourselves was pretty cool, it’s unnerving to think about their struggle and the fact that the once self-sustainable historic town now completely depends on tourists. On a brighter note, a leisurely stroll through these streets was a priceless experience. It was a much needed break from the scary taxi cabs that blast just inches past your toes like maniacs every time you try to cross the street. There was a wonderful tranquility to being on the small boat, propelled by a smiley, happy old man, floating slowly and rocking back and forth through the canals. Some areas of Zhu Jia Jiao were crowded with tourists, but once you walk further in, the place filters into residential housing with locals playing Michael Jackson as they hung their laundry and grilled their lunches outside. We got the travel package from ChinaSSBC. The trip, which included the approximately 1-hour bus ride and tickets to almost every museum, exhibit, and temple within the riverbank town, was only 85 RMB. We left at 10am from the agency and returned before 5pm, just in time to go to the Ikea close by for some meatballs for dinner and a nap on their comfy beds. Signs say, “Private Property, Do Not Disturb,” in response to the amount of tourists that crowd Zhu Jia Jiao. The small town sat several historic buddhist temples. They offer fortune-telling for free, donations accepted. Residential area of Zhu Jia Jiao. It’s rare to be somewhere that isn’t crowded here in Shanghai. Boats are steered by local elderly men with a single oar. A woman knits as she sits by her sorta pop-up shop on the streets of Zhu Jia Jiao. An old couple selling fried fish asked me to “help them out” as I took this photo. The boat drivers chat as they wait for their next customers.